In the world of online casinos, it could be said that there is nothing more important than branding. If players can arrive at a casino and know immediately which operator is behind it, that’s a definite advantage, in most cases. However, this is a concept that can definitely be taken too far, and one of the biggest pieces of evidence of that comes in the shape of Nektan. 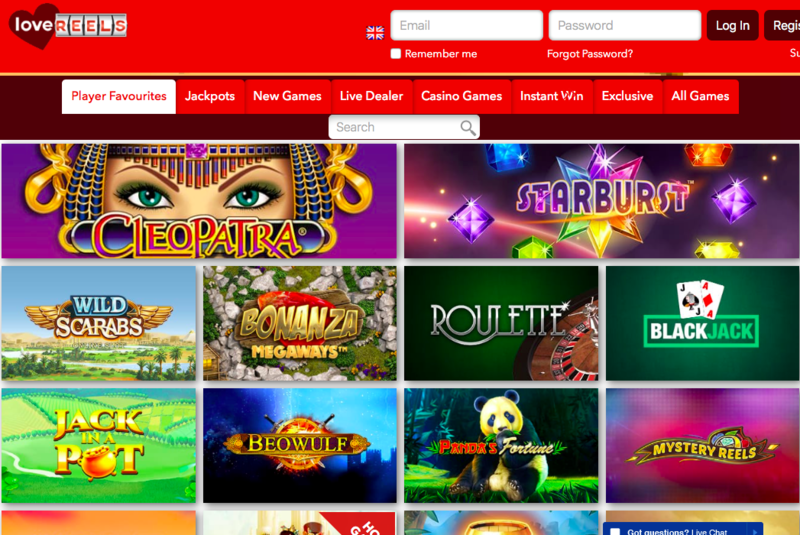 Nektan’s collection of online casinos is vast, but it is fairly difficult to tell the majority of them apart because it feels like the operator just bungs a very small amount of original design (which is normally pretty impressive, just to make things worse) into a template that they are clearly happy with. As a result, you normally get a site that in terms of layout and content is essentially impossible to tell apart from its network brethren. While there have been a couple of recent Nektan releases that suggest the operator may have finally realised that this approach is not going to work out, they are very much back to their old tricks with the newly released Love Reels. The Love Reels theme is brought to life here (and by brought to life, we mean vaguely represented) by the logo at the top of the page. This logo includes a heart behind the word ‘Love’ and reels behind the word ‘Reels’, because it’s never been in the nature of Nektan to think outside of the box when it comes to their designs. Past that, there’s little else to represent love here, despite that clearly being the concept of Love Reels, if you can call it a concept. There’s a red colour scheme, sure, which helps a little, but firstly it’s not enough, and secondly it runs out once you get past the banner at the top of the page. That banner advertises welcome bonuses, uses artwork from popular games, and looks nice enough, but past that, there’s nothing but a white background. 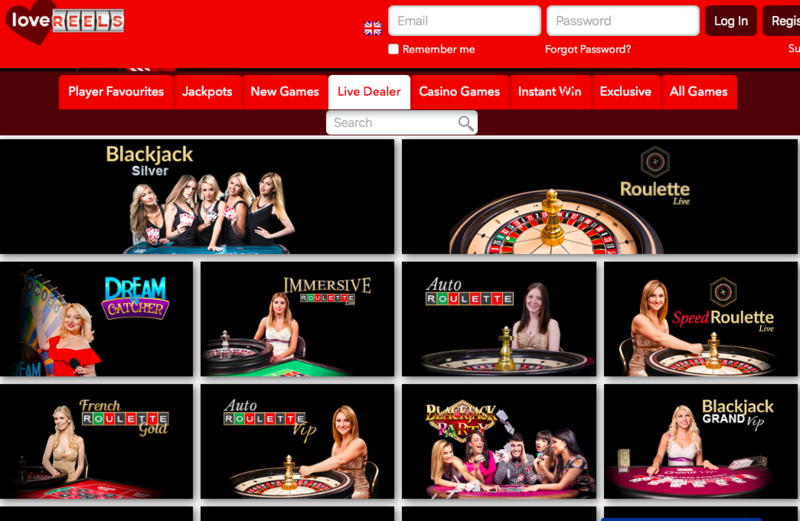 Standing behind the thumbnails on the homepage, maybe the hope here is that this subtle background will allow the design of the games to put them to the foreground, but instead it just succeeds in isolating quite how boring this online casino looks. The selection of games on offer at Love reels should be impressive, in a vacuum, it is, with titles coming from a range of software developers that includes 1X2 Network, Betdigital, Big Time Gaming, Blueprint Gaming, Core Gaming, edict egaming, ELK Studios, Evolution, Extreme Live Gaming, Eyecon, Gamevy, IGT, IWG, NetEnt, NextGen Gaming, Pragmatic Play, Microgaming, Realistic Games, Red Tiger Gaming, SG Digital, SG Gaming, Williams Interactive, and Yggdrasil as well as proprietary software from Nektan themselves. But, being that this is the same portfolio that is available at pretty much every other Nektan casino (down to the point that the thumbnails on the homepage are in the same order) it takes away an element of surprise, this is just something we’ve seen before, wrapped up in a design very similar to the one it was packaged in the last time. Love Reels is absolutely nothing new, and at this point, we’ve come to expect that from Nektan. While there has been change as of late, it is clear that there’s still a long way to go before the release of a Nektan site becomes exciting.